in a slow, supple dance. rarely does another wave back. 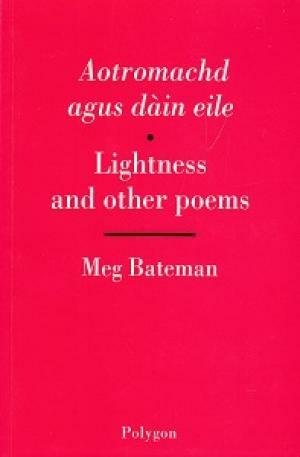 Meg Bateman’s first collection , Aotromachd /Lightness, made a stir when it was published in 1997. Here was a writer in Gaelic, not a native speaker (she studied Gaelic at Aberdeen University and began to write her own poetry in that language), speaking of intimate subjects in a voice that was full of insecurity and yet boldly challenged the received view of Gaelic poetry – certainly as it was received by an English-speaking audience. Anyone who has driven in the Highlands knows what Bateman, who lives on Skye, is describing in this poem, the decisions and the courtesies of negotiating a single-track road. But close communities, whether linguistic or physical, are also confining: we can read the poem as an allegory of island life, even of Scottish life; of choosing to write in Gaelic (for a community of less than 60,000 readers) or English.